UN Emergency Relief Coordinator Mark Lowcock visiting South Kordofan during his three-day mission to Sudan. The United Nations humanitarian chief urged the international community to step up life-saving humanitarian support to 7.1 million vulnerable Sudanese on Monday, and invest more in the country’s social-economic development. 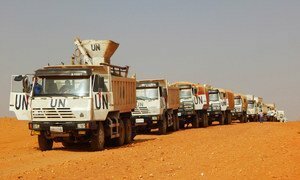 “Millions of people face serious and growing humanitarian needs,” said UN Emergency Relief Coordinator Mark Lowcock, at the end of a three-day visit to Sudan, stressing the importance of unimpeded, sustained humanitarian access. “Many have suffered for the past 15 years, but we cannot let them slide back into a situation where they become completely dependent on humanitarian assistance,” he added, underlining the need to scale up longer-term development aid to help the country make itself more resilient. During his mission, the Under-Secretary-General for Humanitarian Affairs met Government officials, welcoming their efforts to improve humanitarian access to remote areas, including those controlled by non-State armed groups. Mr. Lowcock also spoke with humanitarian partners and visited settlements for those internally-displaced in Murta and Kulba, in South Kordofan. While unilateral ceasefires have improved security across Darfur, South Kordofan and the Blue Nile, recent skirmishes between armed groups in pockets of Darfur’s Jebel Marra region have caused a wave of internal displacement, said the relief chief. “It is critical to strengthen social protection mechanisms for the most vulnerable, including returnees, internally displaced people and host communities,” he said, highlighting his particular concern for the protection of women and children who are vulnerable to sexual violence. Mr. Lowcock commended the Sudanese Government and people in hosting some 1.2 million refugees this year, including over 770,000 from war-torn South Sudan. Price increases mean that many cannot afford to buy food, while recent fuel shortages have impacted the ability of aid convoys to reach many in need. He urged the international community to provide more support to the 2018 UN-coordinated Humanitarian Response Plan, which is appealing for $1.4 billion. So far this year, donors have provided some $229 million. The overall security situation in Sudan’s Darfur region “remains calm”, despite continuing low-level skirmishes, a top United Nations envoy said on Thursday; updating the Security Council on the UN mission’s work on the ground.